This statistic presents the result of a survey of members of the United Kingdom's two major political parties regarding their support for a second Brexit referendum if the Brexit deal is rejected by parliament. 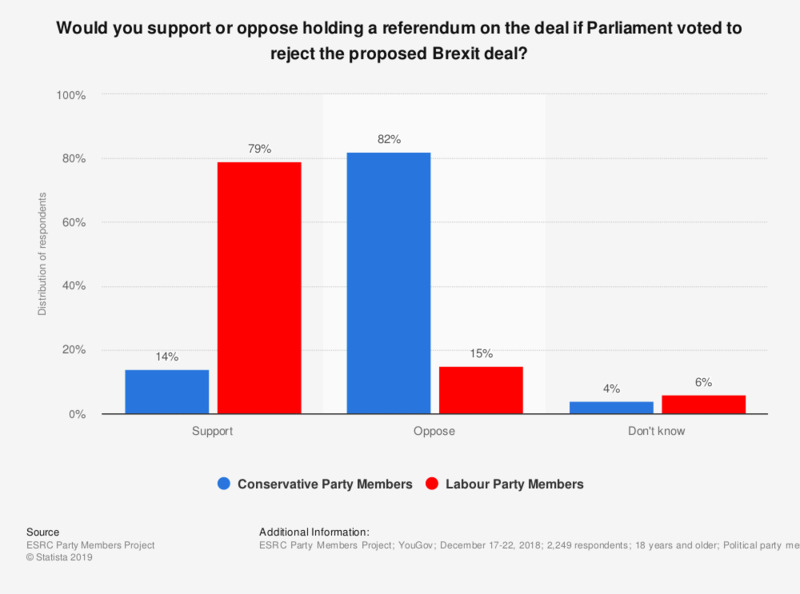 By a large margin, members of the Labour Party support the UK holding a second referendum on it's membership of the European Union, which at the time, went against the party's policy of honoring the Brexit referendum result of 2016. In late February 2019, the Labour Party changed it's stance on the issue and backed a second referendum. This question was phrased by the source as follows: "Imagine that Parliament eventually votes to reject Mrs May’s proposed Brexit deal...Would you support or oppose holding a referendum on the deal if Parliament voted to reject the proposed Brexit deal?"